This fully automatic high-speed capper handles screw caps of all materials and styles from 8mm to 120mm including pilfer evident and child resistant cap closures (standard range is 13mm to 70mm). Handles metal, glass or plastic containers from low jars and vials up to 2-1/2 gallons. 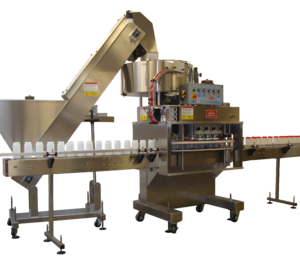 Easily converted to a combination capper similar to the Model G. Comes with a standard rotary cap feeder (optional escalator cap feeder available). Can be used as a cap and pump tightener. Comes standard with clutches for screw capping. Heavy duty patented multiple disc adjustable torque clutches which will give a consistent torque and minimize wear on cap tightening discs (two pairs).